The poet, writer, and wit Dorothy Parker (1893-1967) is one of New York’s most beloved personalities. Known for her dry humor (she penned “Men seldom make pass/At girls who wear glasses”) and sparkling wit, Parker helped start The New Yorker and is a member of the New York Writers Hall of Fame. She was one of the key members of the Algonquin Round Table, which met at the Algonquin Hotel beginning in 1919. Visit Dorothy Parker’s neighborhood and walk in her footsteps to her former apartments, haunts, school and more. See one of the most beautiful and historic neighborhoods through the eyes of a young Dorothy Parker. Learn about the history of the Upper West Side, its architecture and development, all tied into the life of Mrs. Parker. Dorothy Parker’s Upper West Side begins at Riverside Drive and West 72nd Street, at the statue of Eleanor Roosevelt. The Parker walking tour (20 blocks) takes in Riverside Park, Broadway, literary landmarks and architectural highlights. Take photos of stunning architecture. The guide is Kevin C. Fitzpatrick. He is the author of The Algonquin Round Table New York: A Historical Guide (Lyons Press), A Journey into Dorothy Parker’s New York (Roaring Forties Press), Under the Table: A Dorothy Parker Cocktail Guide (Lyons Press), editor of The Lost Algonquin Round Table, editor of Dorothy Parker Complete Broadway, 1918-1922. He’s president of the Dorothy Parker Society. Meeting Point: Riverside Drive and West 72nd Street, at the statue of Eleanor Roosevelt. 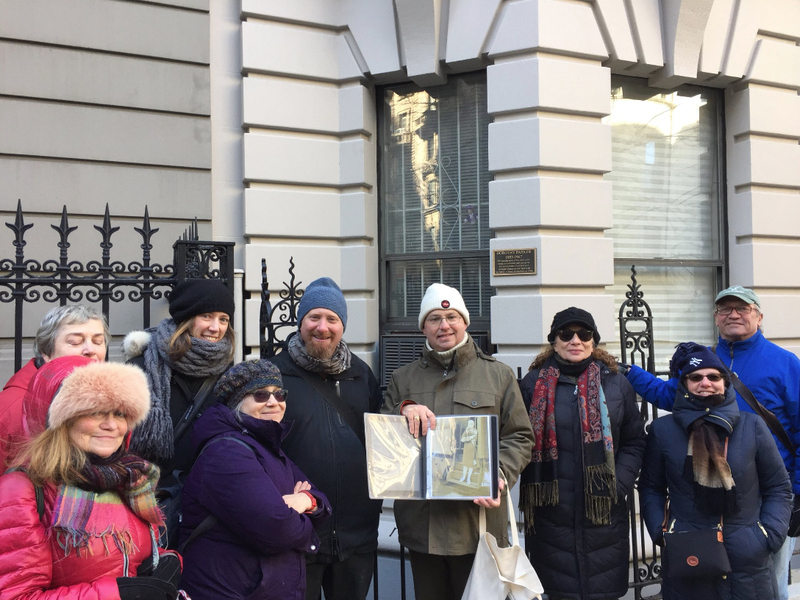 The Parker walking tour (20 blocks) takes in Riverside Park, Broadway, literary landmarks and architectural highlights. The meeting point is at Riverside Drive and West 72nd Street, at the statue of Eleanor Roosevelt. Arrive 15 minutes before the scheduled start time. West 72nd Street and Broadway (1, 2, or 3 train). It’s a 8-minute walk west. Yes. We tour inside some buildings. The visits are for limited amounts of time determined by your guide. You can always return to explore what catches your attention afterwards! No. The tour ends on West 86th Street, the guide will direct you to your next destination. Tours will run rain or shine. We ask that you check the weather forecast and dress accordingly if inclement weather is predicted. If a serious storm is predicted that may impact the tour, you will be notified by e-mail, directly from Big Apple Fanatics Tours, under these circumstances. Yes. There are public restrooms along the route. It is “Smart Casual.” The clothing suggestions vary from season to season. The clothing suggestions vary from season to season. Summer: Lightweight shirts, shorts/skirts. New York summers can be humid. For cooler summer days see spring guidelines. Spring: Lightweight long to 3/4 sleeve shirts, pants or leggings for April/Early May. A lightweight jacket is also needed. Mid-May to early June I suggest to start following the summer guidelines above, but carry a light jacket. Fall: Follow spring guidelines listed above until mid-September. Then dress like winter (sweaters, long pants/leggings) and carry a fleece or jogging suit jacket. Scarf/Gloves/Hat optional. Winter: Warm sweaters, pants/leggings, all-weather boots, parka style coat, scarf, gloves, and hats. Yes! Comfortable shoes are a staple for any kind of walking tour. No flip-flops. Tours generally last 2 hours. Extra cash as we end the tour at a restaurant where food and drinks maybe purchased.